Have you ever seen a man with a great handlebar mustache or Fu man chu and wonder how he was able to tame that long upper lip hair while still keeping it healthy looking? There really is no secret as to how these men have such perfect mustaches, they just found the best mustache wax for their individual staches. Just like not all men’s facial hair is alike neither are all waxes used to control those mustaches. Most men put stache wax into 3 categories, soft, medium, and firm (or hard). Soft mustache wax is normally used in shorter staches to help control stray hairs and simply give the stache a nice sheen and keep it looking and feeling healthy. Medium and firm waxes work well in longer staches and used for both control and to style the mustache. The firmer the wax, the better it tends to hold in hot or humid weather. What brand or type of mustache wax will work for you depends on many different things. It will depend on the coarseness or softness of your facial hair, whether your stache is thick or thin, the style of mustache you wear and even the climate of the area in which you live. Finding the wax that suits you and your stache may take some trial and error, however in order to help you narrow down which brands to try, we have reviewed a number of the best mustache waxes available, and given a short synopsis of how each brand of wax performs. 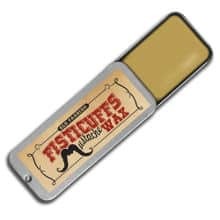 Fisticuffs Mustache Wax doesn’t mean that you will get into a fight when wearing it, but it does mean that if you do get into a fist fight, your mustache is liable to come out of the fight looking much better than you will! 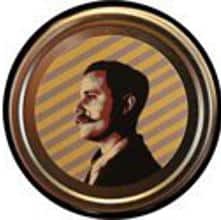 Firehouse Moustache wax is created by real life fireman John Pitts. This is a firm mustache wax ideal for darker brown/black hair. Clubman Moustache wax comes in white/neutral, brown and chestnut and is easy to apply. 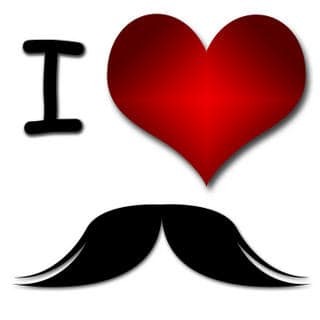 It is a very moldable wax that allows you to shape your mustache in the style you would like. Stache Bomb is one of the firmest mustache waxes that is perfect for those handlebars and has the unique pine scent reminiscent of the state where the wax is made. This Dandy candy moustache wax is a medium firm wax with ingredients which condition as wells as hold. It is completely petrochemical free and holds firmly all day long. Dubs stache cream is an organic and all natural petroleum free wax that comes in two versions, original and firm. The firm holds exceedingly well and is great smelling. The wax itself is handmade and hand poured. 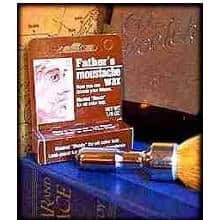 Father’s moustache wax comes in a convenient stick form and is available in a neutral color that will blend with all hair colors. This wax is firm enough to hold without making your stache feel as though it is glued together. 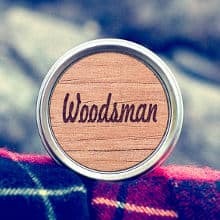 Woodsman mustache wax is an all natural wax that can control your mustache hair even in hot weather. 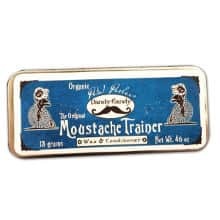 It has an incredibly firm hold and is perfect for styling your mustache into any style you would like. Beardsmen Spirit products are designed for men who want to grow facial hair and keep it well maintained. 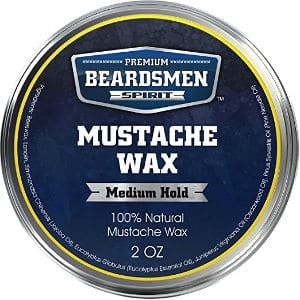 This Beardsmen Spirit Premium Mustache Wax is designed to provide a medium hold for mustaches while still keeping your ‘stache pliable and feeling soft. Comes in a 2 ounce metal tin. Made with Jojoba oil and 3 other essential holds. Since this mustache wax is fairly firm in the container you need to remove it by using the back of your thumb nail to scrape an extremely small amount which you then soften between your fingers or the palm of your hands and then apply to your ‘Stache. Since this mustache wax is made up mainly of oils it should easily wash out with a little soap and warm water when you shower. Reviews and ratings for this Mustache wax couldn’t be better with users finding the following benefits from using this wax. Leaves Mustache and Evens Beard Soft: The oils in this product helps to soften that coarse facial hair and leave your mustache and beard feeling softer and less picky to the touch. Holds Your Styled Stache: Since this is a medium hold mustache wax it probably won’t hold the ends of a 5 foot handle bar mustache for days at time, but it should hold more simply styled mustaches for most of the day. 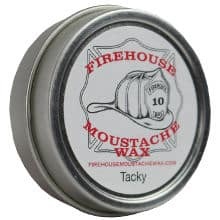 Great Scent: Most users really like the scent of this mustache wax which is actually important since the scent is going to be right under their nose for the entire day. 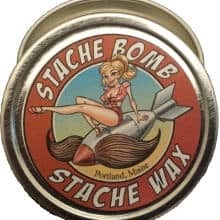 If you are looking for a mustache wax that will offer a firmer hold so that you can style your mustache anyway you would like than Wild Willie’s Mustache Wax may well fit the bill. Comes in an 2 ounce container. Made of all natural and organic ingredients including Shea butter, Sweet almond oil, Tea Tree Oil, cedar wood essential oil, Rosemary oil and yellow beeswax. Designed to provide a firm hold. Wild Willies Mustache wax comes with a little spatula to make it easy to get this firm wax out of the can. Once the wax is removed from the can, warm it with your fingers or palms then work into your mustache. 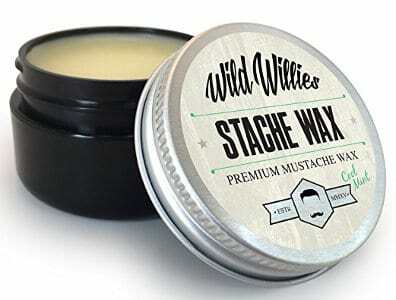 Although many users remove this mustache wax by simply shampooing it out the company recommends you use Wild Willie’s wax to remove the mustache wax more easily. Reviews for this mustache wax are extraordinary with most users really liking the way this mustache wax makes their stache look and feel. Easy to Apply: Most users find that this mustache wax is easy to apply and find the spatula handy for getting the wax from the container. All Natural and Organic Ingredients: Users also like the fact that this wax uses all natural and organic ingredients stating that they are pleased that they don’t have chemical ingredients close to their mouth. 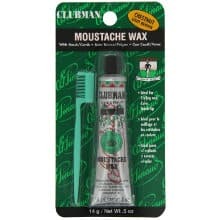 Controls Stray Hair and Holds Mustache Shape: The vast majority of users state that this wax helps them control those wild mustache hairs as well as help hold their stache once it is styled. While this brief look at some of the best mustache waxes can head you in the right direction, remember that it’s only you who can decide the right wax for stache and according to your lifestyle.